It is evening, and I sit in the courtyard by the pool. The palm trees hang over me as if they are tired, their rough bark shed in the flowerbeds. As I read distractedly, I occasionally glance up at Colorado Boulevard, the street that runs past the motel. This mythic street. I learn from Pasadena city signs that Colorado Boulevard is Route 66, but you wouldn’t know it to look at it. 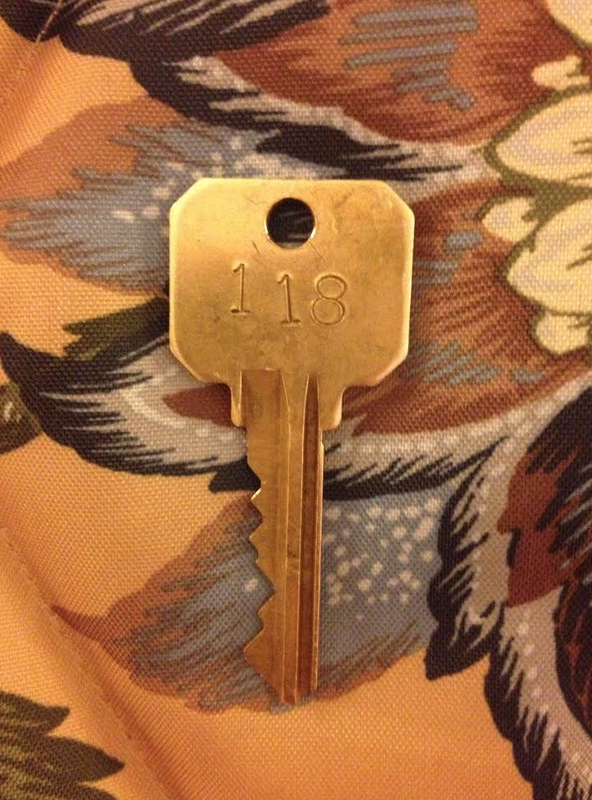 When I checked in to this motel, this relic of the past, I was given a brass key to my room, and I walked around back to my bright peach-colored door: Room 118. Inside was a space that hadn’t changed for decades. Shiny lacquered wood headboards. Marilyn or Sinatra might have slept under the floral bedspread, if they had opted to stay in a motor hotel. I sit in the courtyard, and I try to commune with Route 66, this repository of myth. I see only Colorado Boulevard. Minivans pass. It looks American, but not in a good way. California was my childhood home, but she is no longer familiar. I am a stranger to her, too: I can’t ground myself in space. Pasadena doesn’t really look like a city to me. Perfectly manicured lawns, a landscaped universe. A world of oranges. In one corner of the courtyard, a group of middle-aged Danish men have gathered up the plastic pool furniture and arranged in front of their rooms, and they are talking and laughing. They shout over at me: Come join us! So I do. I learn that they are fathers and sons, maybe five sets of them, and that they’re at the end of a cross-country motorcycle trip along Route 66, which led them through vast spaces. They tell me stories about their trip. About the middle of the country and how flat it was, about which parts look like Denmark and which don’t. I tell them that this stretch here – Colorado Boulevard – is the only part of Route 66 I know. They talk of old gas stations and diners, of prehistoric rock formations and rivers. They talk of breakdowns and changing speed limits, of camping in the mountains in the rain. They talk of Route 66, beyond Pasadena, beyond what I can see. It gets late. They tell me that early tomorrow morning they will drive out to the coast and see the Pacific Ocean for the first time, and then up to San Francisco, and then the plane home to Denmark. The pool glows like a phosphorescent ocean. I think maybe I will go see the Pacific, too, and know her again. Susan Harlan is a professor of English literature at Wake Forest University in Winston-Salem, NC, where she specializes in Shakespeare and Renaissance literature. Her non-academic writing focuses on the intersections between place, objects, and memory. Her essays have been published in The Toast, Nowhere, Skirt!, Open Letters Monthly, Literary Mothers, Public Books, Smoke: A London Peculiar, Cocktailians, Airplane Reading, and Artvehicle.